The guitar class from W.P. 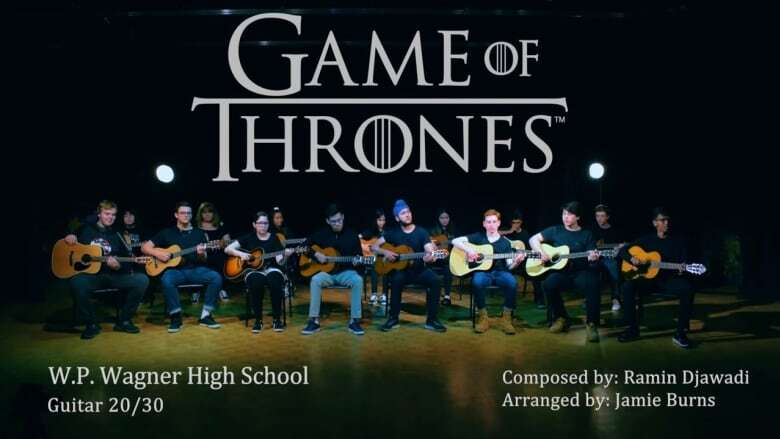 Wagner High School took two days to record a music video for their cover of the Game of Thrones main theme. The video posted to YouTube just before the final season premiered is gaining traction online. A local Edmonton High School is striking while the iron throne is hot. The guitar class at W.P. Wagner got in on the Game of Thrones cultural phenomenon just in time for the show's eighth and final season. The class recorded a two-minute music video covering the main theme from the show. Jamie Burns teaches guitar and photography at the high school, and said he'd wanted to record a music video for a while. "One of the projects I wanted to do this year with my guitar class rather than just do a live concert, which we do all the time anyway, was actually producing a music video," Burns said. "I also teach photography classes and so we have access to some of that gear." Burns said a major piece of the puzzle fell into place in February when he was joined by student teacher Shawn Gan. Gan came with a background that included shooting and producing multi-camera music videos for YouTube. Burns knew this was the time to bring his idea to life. He also knew that the final season of Game of Thrones was looming and that if they planned it right, they could release it just as the final season was about to launch. "We knew this premiere was coming up so we were on a bit of a tight timeline to get it out this week," Burns said. "You know, once the moment passes sometimes you can't ride that. So that's been a pretty cool experience as well to really capitalize on that." Burns arranged the music himself, but noted that having Gan in the classroom allowed him the time he needed. Burns listened to the original piece, composed by Ramin Djawadi, over and over to break down the different parts into something his students could play on the guitar. "It took a couple of days of listening and adjusting and putting those things down," Burns said. "We had to find a key that worked. We had to make sure the students could play it, that it was within their abilities. In the end, I'm really pleased with the process." Burns said 18 Grade 11 and 12 students took two days to complete the project. On the first day they completed the audio recording, which took multiple takes to get a perfect performance. "On the one hand it was a lot of takes for them and I think they might not have fully understood that is the kind of work that you have to do in a real studio," Burns said. On the second day the students gathered in the theatre at W.P. Wagner to film the video, which also meant another day of playing the same song over and over. "As we told the students, imagine if this was a full album or a music video that you were shooting," Burns said. "They start to understand what really goes into the process. That's one of the best parts of this project. It's very real world, very authentic." The students were skeptical about the video's potential popularity but in just one day the post was viewed 500 times, he said. It now sits at nearly 1500 views after just three days online. Burns said the music video project was like a theory exam for his students and something he's hoping to incorporate regularly into the course in future years.